الخيار الأفضل للحصول على المتعة والاسترخاء, Paperbark Camp يقع في منطقة وولاميا في جيرفيز باى. يقع مركز المدينة المثير على بعد 3.5 Km فقط. يوفر الفندق بفضل موقعة الجيد وصولاً سهلاً إلى أهم معالم المدينة.
. إن الخدمات الممتازة وحسن الضيافة العالي في Paperbark Camp تجعل إقامتك تجربة لا تنسى. لضمان راحة ضيوفه، يقدم الفندق الخدمات التالية: واي فاي مجاني في جميع الغرف, واي فاي في المناطق العامة, صف السيارات, التوصيل من وإلى المطار, مطعم . استمتع بوسائل الراحة الراقية في الغرف أثناء إقامتك هنا. بعض الغرف تتضمن اتصال لاسلكي بالإنترنت, اتصال لاسلكي بشبكة الإنترنت (مجاني), شرفة/ تراس, مستلزمات التجميل, دش لمساعدتك على استعادة طاقتك بعد يوم طويل. يقدم الفندق مجموعة رائعة من الخدمات كمثل تدليك, حديقة, رياضات مائية (غير آلية)، لجعل إقامتك تجربة لا تنسى. إن Paperbark Camp هو مكان مثالي للمسافرين الذين يتطلعون إلى الراحة والاستجمام في جيرفيز باى. The location was very tranquil, being in nature yet had all the creature comforts of home (if you're the type that wants an activity-packed itinerary, this isn't the spot - it is perfect for relaxation, reading a good book and enjoying the outdoors). The food was top notch amazing - we were pleasantly surprised with the quality of the tent also, which was warm through the night. We had visits from friendly possums nearby. The in-room massage was a real treat - the staff were so accommodating to book me in last minute and all details were not spared. We celebrated our two year anniversary here and would definitely come again when it's time for another break from the kids! The whole place was amazing - paella night was beautiful, breakfast was lovely, the staff were fab - very friendly and great recommendations for what to do each day and the tent itself was so nice we didn't want to leave! Even had a kangaroo bounce past in the morning! Perfect glamping experience - they'd thought of everything and the little touches made it really special - we'll be back! staffs are nice, food is delicious, really nice experience. Our stay was very good. The tents are great and the staff professional. We were dissappointed to have set menus in the restaurant rather than the full menu that many reviews praised. We would not have expected set menus in such a venue for its pricee. 1. served great alcohol 2. great fireplace when lit. 3. good walks. arrived for a 5 star experience first thing upon arrival we learnt there was no electricity provided in the tents. our tent had at least 6 faulty zips so the tent was not mozzieproof at all. the place was cold and no form of heating provided. we have done similar trips in africa and paperbark should go back to school there. Unique but that's about it. Run down and freezing. Disappointing. I heard good things but the reality and very different. I left after the first night as we were so cold. Good was average and cost $60 per head. The water for the bath was like warm and I ended up carrying kettles over. They charge top dollar (eg next evening I stayed at a five star hotel with super dinner and breakfast for less than just the room!!!) staff did not handle my complaint very well although agoda was kind enough to refund the second night. Great facilities and isolation. Fastastic dinner option and bar. 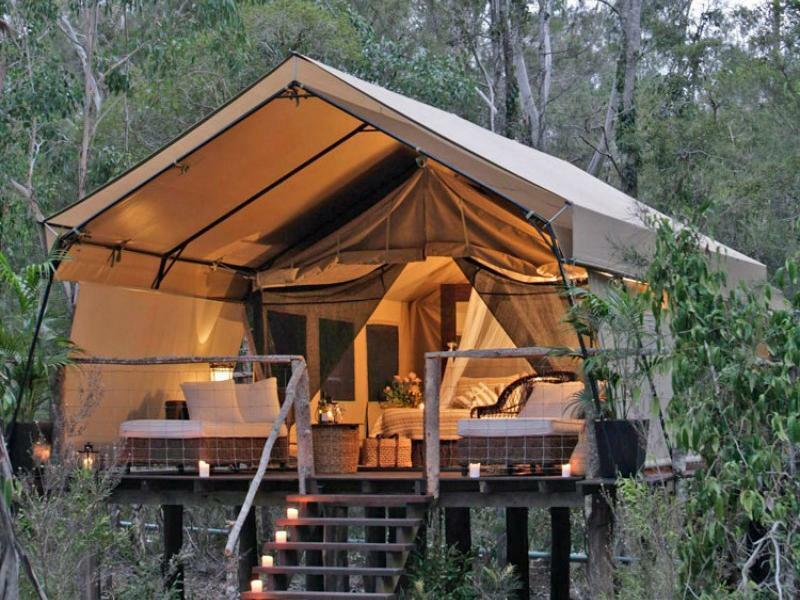 The paperbark camp is definitely on the glamping path. Those looking for a not so comfortable camping experience this is definitely not for you. 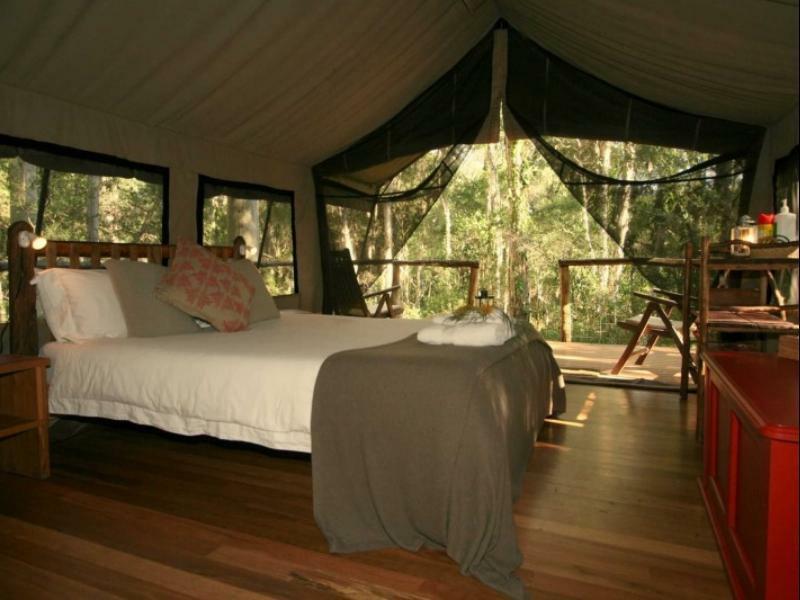 The tents are well equipped and once inside well isolated from the elements and the bugs. The whole experience definitely helps immerse you in the surroundings which are spectacular. 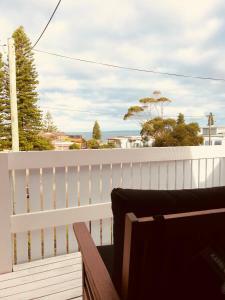 A fantastic option for those looking for something a little different around Jervis Bay. As a newly engaged couple, we couldnt have asked for a more romantic setting to celebrate! Only two things to note, there is surcharge per person on a Sunday night - which was unfortunate as we only ordered a Cheeseboard!! The Wetlands walk is just through the forest and leads out to the car park! Nothing to see other than the trees and is a bit eerie! 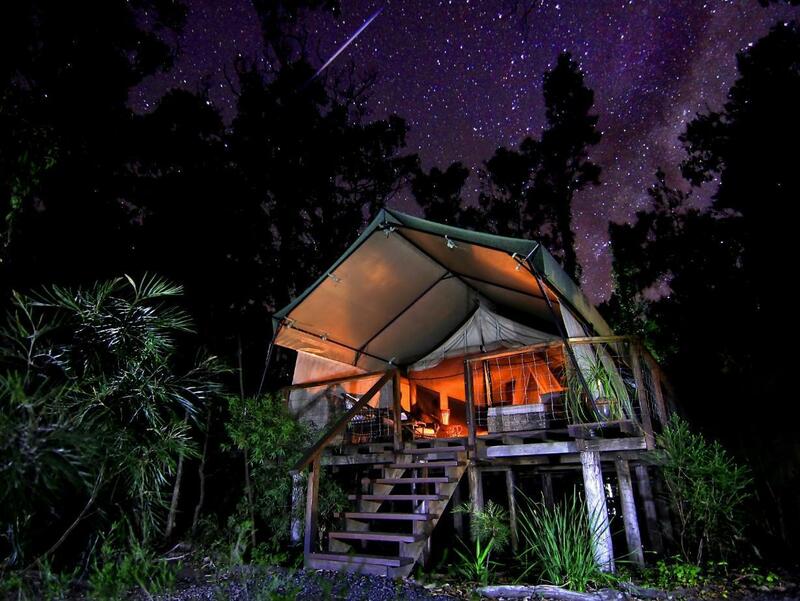 Thats me being picky - great location, romantic setting, very comfortable tent and also got a visit from a possum! We were upgraded to the deluxe tent after the hot water wasn't working in our original tent. Although there was no heaters, there was sufficient blankets to keep warm at night and we woke up to the lovely sounds of birds chirping. We also used the canoe and bikes. Overall a great place for a relaxing eco getaway!